The resignation of Gary Cohn (who was vehemently against tariffs) roiled markets early last night, fanning fears of protectionist tariffs and a full-blown trade war. Global equities plunged with the NIKKEI down 0.8%, the SCI off 0.6%, European markets were 0.2% - 0.4% lower, and S&P futures dipped 1.5% to 2681. A dip in oil (WTI $62.34 - $61.65) from the API’s report showing a larger than expected build in US oil inventories further weighed on stocks. Investors ran to the safe havens as the yield on the US 10-year bond sank to 2.84%, and the yen rose from 106.19 – 105.45. The DX slumped to 89.39, which took gold higher. The yellow metal tripped some buy stops over $1335 (50% retracement of down move from 1/25 $1366 high to 3/1 $1303 low), and yesterday’s high at $1338 to reach $1340.50 – where resistance at the 2/26 high held. Weighing on stocks but mitigating gold’s advance were some hawkish comments from the Fed’s usually dovish Lael Brainard last night (more confident inflation will hit the 2% target, more upbeat on the economy, “headwinds shifting to tailwinds”). 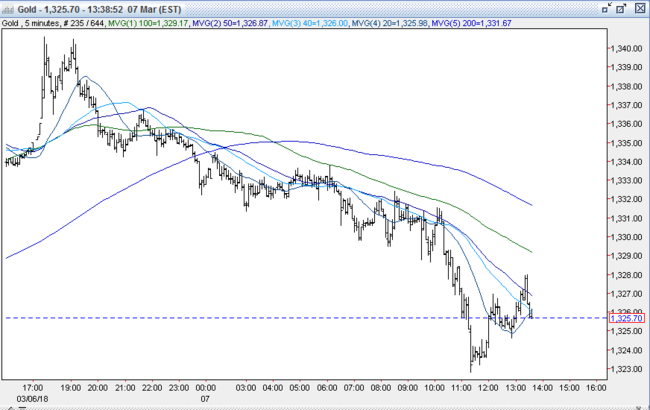 Later during the evening, S&P futures pared some losses to 2707, while the 10-year yield recovered to 2.874%. The dollar rebounded to 89.66, and gold sold off. It spit back all off its earlier gains until finally finding support at $1330. At 8:15 AM, a stronger than expected report on ADP Jobs (235k vs. exp. 200k) was followed by stronger readings at 8:30 AM on Productivity (0 vs. exp. -0.1%), and Unit Labor Costs (2.5% vs. exp. 2.1%), and outweighed a slight miss on the Trade Balance (-$56.6B vs. exp. -$55B). This was accompanied some conciliatory remarks by Commerce Secretary Ross indicating there was a degree of flexibility with respect to the proposed tariffs (“we’re not looking for a trade war, we’re going to have very sensible relations with our allies”). S&P futures climbed further (2713) while the 10-year yield remained steady around 2.87%. 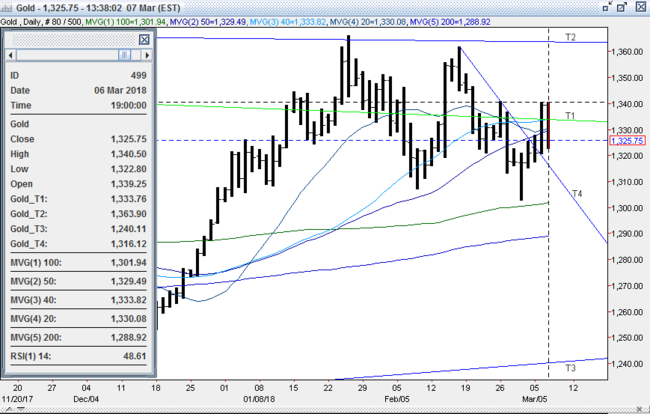 The DX rose to 89.70, and pressed gold to $1328. At 10:30 AM, the EIA reported a smaller than expected build in oil inventories, and a surprise draw in gasoline that took oil higher (WTI to $62.58), and pushed US stocks up further. The S&P reached 2724 (-3) by late morning and the 10-year bond inched up to 2.83%. The DX touched 89.78, and gold slipped further to $1322.80 – giving back just about all of its gains from yesterday. Into the afternoon, US stocks softened again (S&P -26 to 2702, Boeing and energy led decliners) with a reversal lower in oil (WTI to $60.56) contributing to the decline. The 10-year yield dipped back to 2.85%, and the DX was tugged down to 89.65. Gold recovered, and traded up to $1327. Open interest was up 8.5k contracts, reflecting a good chunk of new longs (along with some significant short covering) from yesterday’s rally. Volume was much higher with 305k contracts trading. All markets will continue to focus on the volatility in the equity and bond markets, geopolitical events, developments with the Trump Administration (especially the tariff situation), corporate earnings, oil prices, and will turn to the Fed’s Beige Book at 2PM, followed by reports tomorrow on Japan’s Trade Balance, GDP, China’s Trade Balance, Foreign Direct Investment, German Factory Orders, ECB rate decision, and US Jobless Claims for near-term direction.